24 Hour Clean Hold. 98% Naturally-Derived. No Silicones. No Parabens. No Dyes. 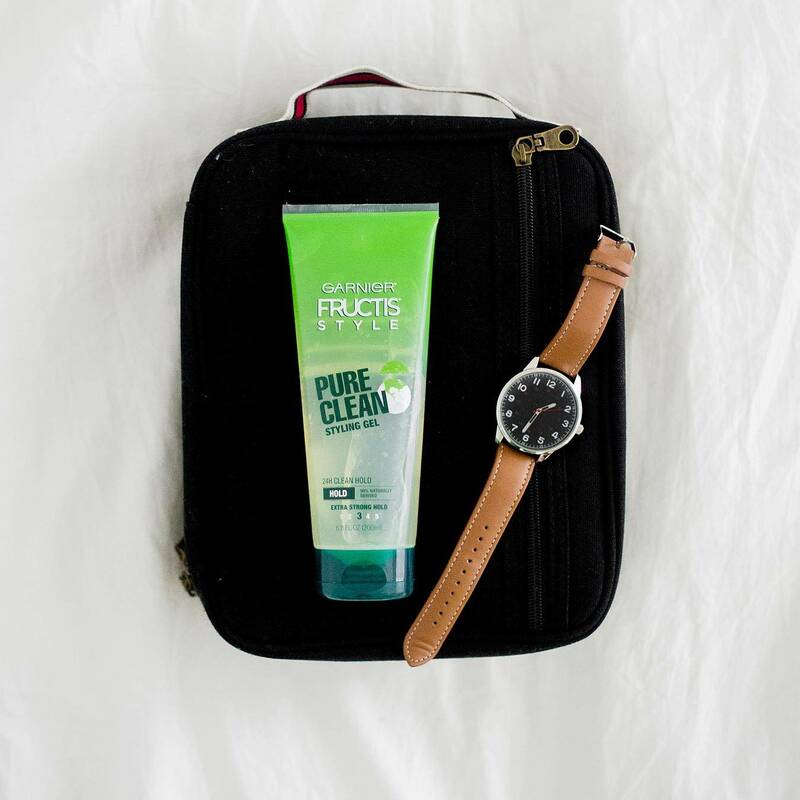 Garnier® Fructis® Style Pure Clean is our first naturally-derived hair styling line with 24 hour clean hold + pure performance. Acacia Gum is used around the world for its natural holding properties. 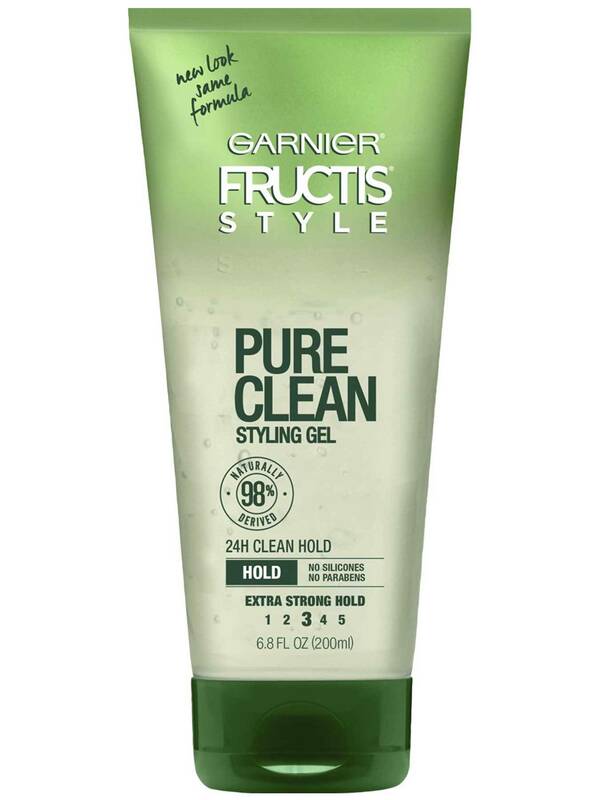 Garnier® Fructis® Style Pure Clean Styling Gel is a 98% naturally-derived hair styling gel with Acacia Gum that gives extra strong hold, all day, and is non-flaking with no residue. Comb hair gel through towel-dried hair, smoothing hair against head, and air dry. Rub a quarter size amount of gel between palms. 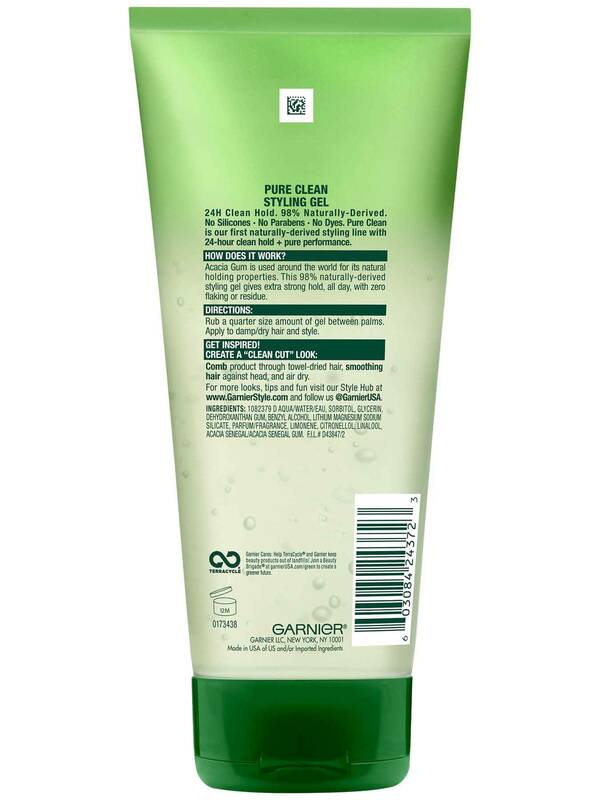 Apply to damp or dry hair and style. Rated 4 out of 5 by maryc7ac7 from I thought this product was good. It had a nice scent. It did meet my expectations except it weighed down my baby fine hair.It was somewhat heavy and I had to wash my hair the next day. Rated 5 out of 5 by sharonh1 from I love this gel it has a great smell to it it works good . I get this all the time from Walmart they have good prices on it . I really recommend this to everyone who likes to fix there hair . Especially people with curly hair . Rated 3 out of 5 by caelins from The texture of this gel isn't my favorite, but the hold is still fairly decent. I prefer other brands to this one. Rated 5 out of 5 by daniellek20 from Love love love this product! Holds great and make my hair smooth and silky even when styled !!! Rated 5 out of 5 by amyp11 from Love the styling gel!! Makes my hair feel soft without being too textured. Always easy to style with this and doesnt make my hair greasy at all! Rated 4 out of 5 by heathera14 from The hair gel does the job of holding my hair in place when I need to wear my hair back in a pony tail or bun. I really don't like how it makes my hair so stiff when I do use it, I don't use large amount of gel to slick my hair back with either. I would like to at least be able to feel like my hair is a bit more natural as opposed to a "helmet head" feeling. There is room for improvement, but I still like this product.